Playing poker in land-based casinos is certainly different from playing poker online. The rules may be the same, but the feeling may differ. Casinos offer social interaction and drinks, while online poker rooms cannot really offer such things, but offer a lot more features instead. But is there another way to play poker apart from these two options. Well, if we don’t take VR into account, it is safe to assume that one very entertaining way to play poker is by playing video games. Several computer and console games actually included some form of poker that you can play and earn in-game money. Although none have poker as a focal point in their respective storylines, the majority use poker as a side game that players can play in order to relax and enjoy their in-game time. However, if you are a poker player, you are probably going to devote a lot of time to exploring poker options in a game rather than playing the main quest. We decided to cover a couple of games that include poker in them, and the first one on our radar is Grand Theft Auto IV. How to Play Poker in GTA IV? Grand Theft Auto is a long-running franchise made by Rockstar games, and it is the single most popular game franchise in the world. The fourth installment was published in 2008 and features a Bosnian immigrant called Niko Belic as the main character. Let’s be clear right at the start — you cannot play poker in this game. GTA games are usually set in fictional cities that resemble cities in the US. For example, Vice City would probably be Miami, while Liberty City is probably New York. 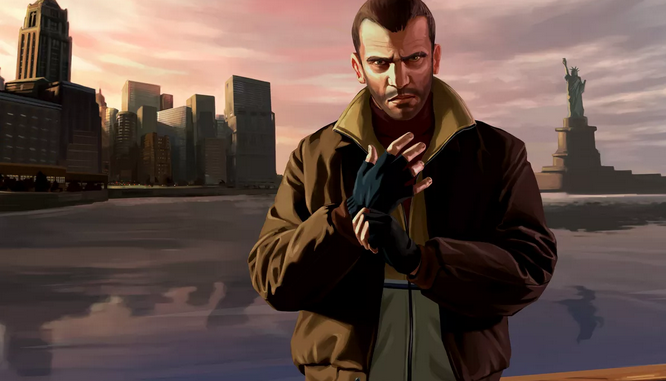 The latter is the setting for GTA IV, where Niko engages in a set of activities in order to help his struggling brother and find another war veteran who betrayed him during the Bosnian war. Players can steal cars, shoot enemies, and engage in various missions which are filled with action and memorable characters. However, players can also enter Internet cafes and surf the web. Whenever Niko turns on a computer, he is able to browse through 80 made-up sites which offer various services and interesting content. One of the sites is pokerintherear.com where Niko can try to play poker, albeit unsuccessfully as the ‘New Online Gambling Law’ strictly prohibits it in the game. This is obviously a satire regarding the UIGEA of 2006, and the guys developing the game wanted to make things pretty much like in real life at that time. However, Niko can watch something called “The Venturas Poker Challenge” while sitting and watching his TV. This is a televised poker event which even includes commentators which are also pretty ironical about the idea that somebody watches other people play cards. In other words, the game kind of makes fun of the whole poker expansion which was popular at the time. But then again, GTA games make fun of everything. Government of Macau Banning Casino Employees from Gambling?